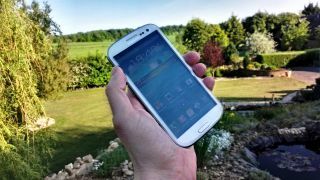 The Samsung Galaxy S3 is starting to get the Android 4.1.2 update, which may not seem like a big deal on the surface, but there are some key new features packed inside. First up the multi-view function lets you have more than one app on screen at a time for an enhanced multi-tasking experience. First seen on the Galaxy Note 2, the Galaxy S3 is only the second handset to get this nifty functionality, letting you snap apps above and below each other on the phone's 4.8-inch display. Page buddy is something else we saw on the Note 2 and has now made the leap across to the S3 – for example, plug in a set of headphones and a dedicated homescreen will appear giving you options related to the action, such as offering links to the music player. Also bundled in the Android 4.1.2 update is an updated gallery app which matches the one found on the Note 2, plus a customisable notification panel, swipe input for the keyboard and smart rotation – which will only rotate the screen if the phone detects you want landscape mode and are not just lying in bed with your S3 at a weird angle. The roll out started in Poland and the over-the-air update will make its way round countries worldwide in the coming days and weeks – so keep an eye out for it on your Galaxy S3. No word on US availability just yet, but it's surely only a matter of time.